The question paper has 30 questions in all. All the questions are compulsory. Questions from serial number 1 to 9 are multiple choice questions. Each question carries 1 mark. Questions from serial number 10 to 21 are 3 mark questions. Answer of these questions should not exceed 80 words each. Questions from serial number 22 to 29 are 5 marks questions. Answer of these questions should not exceed 100 words each. Question number 30 is a map question of 5 marks. Follow the instructions and after completion, attach the map inside your answer book. Q.2. Who organized the Dalits into the depressed class association in 1930. Q.3. Which mode of transportation reduces trans-shipment losses and delays? Q.4. Name the organization set up by the Nepalese people to restore democracy in Nepal. Q.5. Which of the following is considered as the best form of Government? Q.10 “The Balkan issue was one of the major factors responsible for the first world war”. Explain with examples. “Only one third of the students in Vietnam would pass the school leaving examinations.” Explain. Q.11. Critically examine any three efforts made by Gandhiji to get Harijans their rights. Q.12. How did World War I help in the growth of the national movement in India? Q.13. A study reveals that sugar mills are getting shifted to the Southern and Western states of India. Why is it so? Q.14. What are the three types of gauge system in India? What is the disadvantage of such a system? Q.15. Explain any three features of Indian Tourism as a trade. Q.16. Why do you think that solar energy has a bright future in India? Q.17. Differentiate between National Political parties and Regional Political Parties. Q.18. How do interest groups influence politics? Q.19. Mention any three challenges faced by Political Parties. Q.20 What are the various ways in which MNCs set up or control production in other countries? Q.21 Who supervises the functioning of banks? In what ways is the supervision done? Q.22. Briefly trace the process of German Unification. Explain the contribution made by the French in the field of agriculture in Vietnam. Q.23. What was the reaction of the British Government towards Civil Disobedience Movement? Q.24. Discuss the steps to be taken to minimize the environmental degradation. Q.25. How does democracy produce an accountable, responsive and legitimate government? Q.27. What do you understand by Liberalization of economy? What steps have been taken in the direction of Liberalization? Q.28. What are the modern forms of money in India? Why is it accepted as a medium of exchange. How is it executed? Q.29. Why is the rise of consumer awareness essential? Explain the measures to protect the interest of consumers. Q.30. 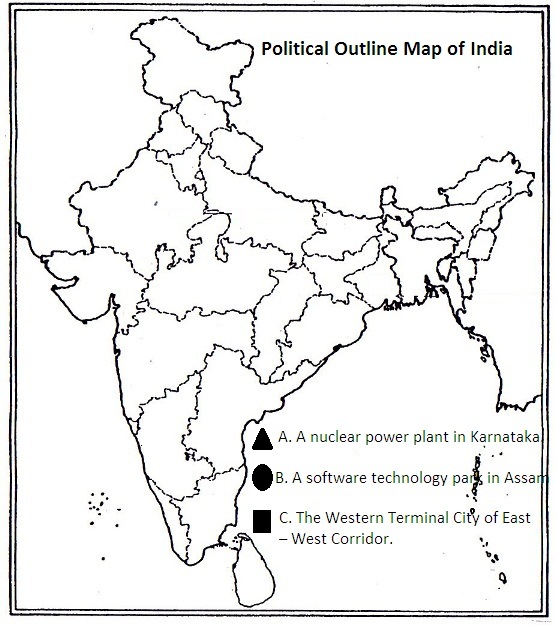 (a) Three features – A,B & C are marked in the given political map of India. Identify these features with the help of the following information and write their correct names on the lines marked in the map. A. A nuclear power plant in Karnataka. C. The Western Terminal City of East – West Corridor. Q.30 (b) Locate the following features with appropriate symbols on the same political out line map of India.